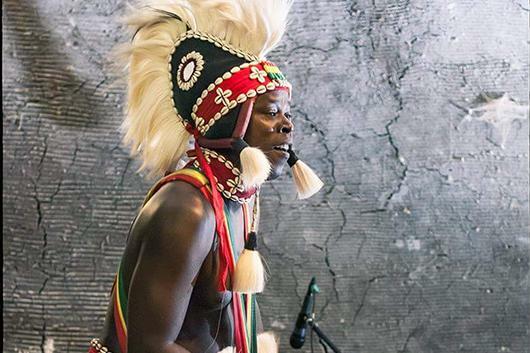 Born in Morowaya, Guinea, Bolokada is a Master Drummer in the Mande tradition, specializing in the djembe drum. As a teenager, he became known as a young musical prodigy in the Sankaran region of Guinea, West Africa. In 1996, Bolokada became lead soloist of Les Percussions de Guinée, Guinea's premiere percussion ensemble. With the ensemble, he toured in the United States and Europe, gaining an international reputation as a djembe player and performing with Elvin Jones, Joan Baez, and Mickey Hart. Since 2004, he has been performing and teaching in the United States. He's conducted percussion workshops all over the U.S. and Europe and has performed in France, Italy, South Korea, Canada, Mexico and more. Bolokata has started drumming and dance troupes in Oakland, CA; Champaign, IL; Nashville, TN; Boston, MA; and most recently in Asheville, NC and Greenville, SC. He has published two CDs, "Sankaran" and "Morowaya," an instructional DVD ("M'bara"), and a DVD of in-context performances in Guinea, "M'bemba Fakoli;" all of these are published on the Abaraka label. He is featured in the IMAX movie "Pulse: a STOMP Odyssey" and is the subject of an upcoming documentary, "Bolokada Conde, Malinke Village Djembefola." Bolokata currently lives in Greenville, SC, where he's worked with Anderson University and North Greenville University students, and performed on both campuses. The Duke Djembe and Afro-Cuban ensembles are directed by Bradley Simmons.